A Waldorf Astoria Wedding Photographer is able to experience a venue that posses an incredibly rich and unique history. The tale of the hotel began with millionaire William Waldorf Astor, who opened the 13-story structure on the corner of Fifth Avenue and 33rd Street in Manhattan, New York. Four years later, the Waldorf Hotel was joined by the 17-story Astoria Hotel next door by William’s cousin. The hotels prospered for some time, but in 1929 the site was eventually sold and the space was cleared for what would soon become the Empire State Building. The second Waldorf-Astoria hotel opened in its current location on Park Avenue in 1931 and at the time was largest hotel in the world. The legendary hotel has since welcomed every president since Herbert Hoover and was dubbed by Conrad Hilton as “The Greatest of Them All”. The Waldorf prides itself on catering to every need of couples who choose to celebrate their nuptials within its walls. Every wedding, from low-key and intimate to lavish and large, is a reflection of the individual couple. The wedding pictured was on the more extravagant side and it was a day filled with love, laughter, and beauty, a truly blessed day to be a Waldorf Astoria Wedding Photographer. This iconic black and white photograph fits the regale atmosphere of the luxury hotel. The photograph is timeless and looks like a clipping from a vintage magazine. The image of the bride is reminiscent of a classic, old Chanel No. 5 advertisement. The bride’s makeup is immaculate, complementing her natural beauty. 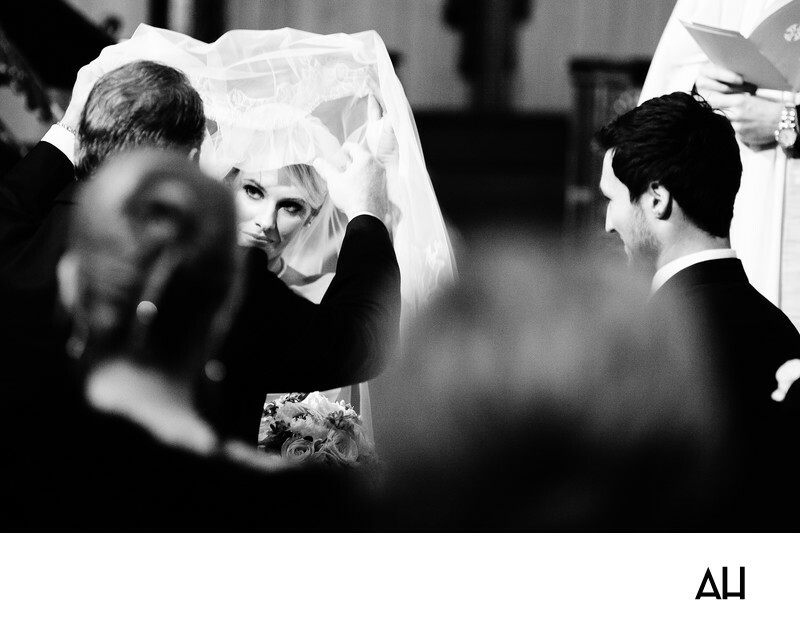 The image shows the moment that her father lifts her veil and prepares to give her away to her husband-to-be. Next to the endearing father-daughter scene, the groom looks at his bride affectionately, ready to join her in marriage.